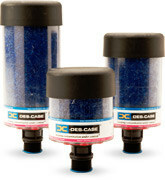 Des-Case’s Standard Disposable Breathers have been designed to work in a wide variety of industries and applications. The breather’s resilient, integrated nylon standpipe ensures that it can easily combat high vibration and volatile environments. Each breather is outfitted with a clear, rugged polycarbonate casing that allows easy view of color-indicating desiccant in order to monitor when the breather should be replaced. With over 25 years of contamination control expertise, Des- Case breathers attack the source of contamination, making the products an affordable and cost effective solution to extend lubricant life and to increase equipment productivity. 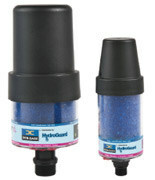 The Hydroguard Hybrid Breathers handle air volume caused by thermal expansion and contraction only. The threaded standpipe design can easily be adapted to any size reservoir opening. Please see below for details on all Hydroguard™ Hybrid Breather models. The Des-Case Ventguard™ Hybrid Breather comes in a variety of models that can easily adapt to any machinery application. Please see below for details on all Ventguard™ Hybrid Breather models. 0.14 kg/0.97 kg 0.52 lbs/3.37 lbs. 0.55 kg/3.51 kg 1.87 lbs/11.74 lbs. Every element of Des-Case’s Extreme Duty Disposable Breathers has been designed to take contamination control to a whole new level, standing up to a wide variety of applications in challenging environments. Des-Case Extreme Duty Breathers attack the cause of contamination, keeping dirt and water where it belongs – out of your equipment. Rebuildable Steel Breathers were designed specifically for applications where there are very high temperatures, extremely polluted air, or a corrosive environment. They are ruggedly designed, with housings of powder-coated carbon steel or stainless. The hygroscopic agent (desiccant) is enclosed in a bag of polypropylene filter material. This desiccant bag filter is easily installed when it is time to replace or recharge the unit. The 1-micron pleated filter has a large surface area, resulting in long service life. Like the bag filter, it is easily replaced without removing the breather from service. Rebuildable Steel Breathers accommodate large air flow rates with minimal pressure drops. Connection Size (NPT) 2" 2" 2" 3" 3" 3" 3" 4" 4" 4"